The leading independent specialist for windscreen replacement and windscreen repair based in Londonderry and serving all of the Londonderry area. National Windscreens Londonderry fitting centre provides windscreen replacement and windscreen repair services to businesses and individuals throughout Londonderry and the Londonderry area. 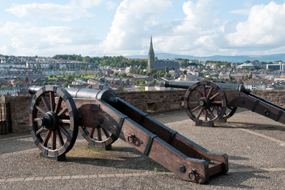 Londonderry, sometimes known as Derry, is the second largest city in Northern Ireland. It lies on the banks of the River Foyle, which can be crossed by two road bridges; one is the A515, whilst the other is the A2. The history of Derry’s economy is largely based on the textile trade which predominantly employed women - leading to high male unemployment and emigration. The historic walled city offers a number of tourist attractions and is currently the UK’s City of Culture 2013. The Londonderry windscreen fitting centre and its mobile vehicle glass technicians service the needs of Londonderry and the surrounding area including Strabane, Portstewart, Limavady and Coleraine. With 108 fitting centres and over 800 mobile technicians, National Windscreens operates the UK's largest windscreen repair and windscreen replacement network. The company provides low cost, high quality windscreen replacement and windscreen repair from its Londonderry fitting centre 24 hours a day, 7 days a week, 365 days a year. Repair and replacement of all types of vehicle glass including windscreens, rear windows and side windows is undertaken throughout Londonderry and all of the Londonderry area.